If you visited Gluten Free Philly in the past week, you noticed a redesigned blog. I created separate sections for the restaurant and bakery lists and corresponding maps, tabbed at the top of every page. (Update your browser's bookmarks for those pages if you have them saved.) I was also able to give more room to the posts themselves, which makes for a cleaner appearance. As part of a new layout, I also moved the search bar to the upper right of each page, making it easier to search though older posts. Drop me a line if there's any other features you'd like to see. Earlier in the week, I wrote about my family's recent weekend in New York City and highlighted our largely successful gluten-free meals. From New York to New Hope: Gluten-free pizza is now available in that Bucks County town at Peace Out Pizza (7 East Bridge Street, 215-862-2266). There are two additions to the Asian section of the restaurant list. First is Susanna Foo Gourmet Kitchen in Radnor (555 East Lancaster Avenue, 610-688-8808), which last week hosted a celiac awareness dinner. The kitchen has been trained on cross-contamination issues by the National Foundation for Celiac Awareness and is now GREAT-approved. Also new is Buddakan, with locations in Old City Philadelphia (325 Chestnut Street, 215-574-9440) and in Atlantic City at the Pier Shops at Caesars (1 Atlantic Ocean, 609-674-0100). The Philly location has gluten-free menus available for diners. Thanks to L.A. blogger Stephen of Gluten Freeways, who recently ate at the original Old City outpost, for the tip. Down the shore in Avalon, the new Seaglass restaurant replaces the Dining Room at the Golden Inn. Seaglass has gluten-free breakfast, lunch and dinner menus. Breakfast is the most intriguing, with waffles, bagels and cereal among the selections. Italian chain Carrabba's has posted an updated gluten-free menu at its website. July 18 is the grand opening date for Wegmans in Malvern (50 Foundry Way, 484-913-9600). I was able to check out the new Whole Foods Market in Plymouth Meeting recently - it's a huge store with a beer and wine section. I spotted a few gluten-free items that I haven't seen at the Marlton location where we shop, including Maryland-style Jumbo Lump Crab Cakes from The Crab Ladies and Better Batter baking mixes. The beer selections include Redbridge and New Grist. Conte's Pasta's dedicated gluten-free manufacturing facility in Vineland should be in operation later this summer. The company is working on a line of flatbreads - traditional, tomato basil, garlic, onion and spinach. Shabtai Gourmet offers a flat-rate $5.95 nationwide shipping deal for its wonderful gluten-free cakes and cookies. Look for the bakery's new chocolate chip biscotti online and in area markets such as Acme, ShopRite and Wegmans. Exclusive to stores is a new 7" layer cake - thick sponge layers separated by chocolate creme and covered with dark chocolate. 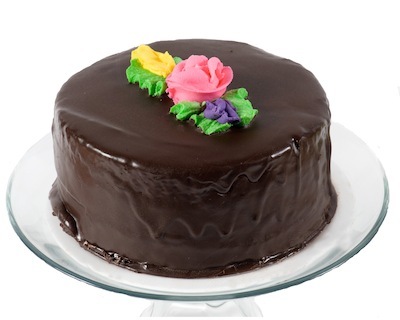 If your local market carries Shabtai's products, order the cake one month in advance by filling out an order form and giving it to the store manager. It should be a great weekend weather-wise. Get out and enjoy it!